Tangled and True: want to make something delicious? I love lemon. No really. Pretty much anything with lemon (or lime) makes me happy. These chicken skewers do not disappoint. We recently served them at a backyard garden party, and received many requests for the recipe. They were cold at the party, but are great fresh off the grill as well. Perfect for a shower, luncheon or birthday party. Enjoy. In small saute pan over medium-high heat, toast fennel seeds, stirring frequently, until fragrant, about 4 minutes. Transfer to a small bowl; cool 5 minutes. Using spice grinder (I just used the end of my rolling pin) finely grind seeds. Transfer to a large bowl. Add lemon zest, lemon juice, honey, olive oil and salt; whisk to combine. Add chicken, cover and refrigerate 6 hours - or overnight. 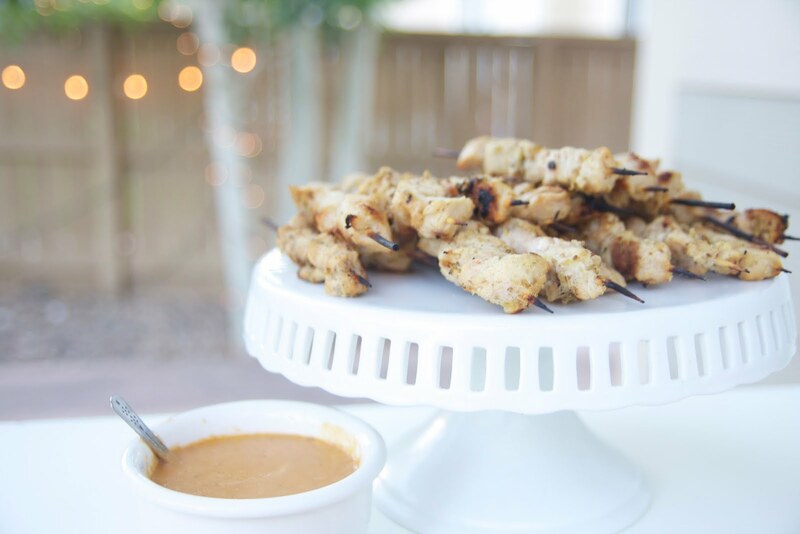 Thread chicken onto wooden skewers. Cook on medium high grill 8-10 minutes, turning twice to grill on all sides. Serves 6. In small sauce pan, cook coconut milk, brown sugar, curry paste, fish sauce, ginger and garlic over medium heat. Bring to a simmer and cook 2 more minutes. Reduce heat to low and stir in peanut butter. Cook for 3 more minutes, or until peanut butter is well blended. Serve warm. Funny, I was just going to call you and get the recipe. They truly were amazing! those look delicious. i will be adding them to the menu asap. and i love the photo w/the lights twinkling in the back.